Antonio Conte is hoping to replace the outgoing Branislav Ivanovic by making a last-minute bid for Schalke defender Sead Kolasinac. That’s according to the Sun, who claim the Bosnian could still leave Bundesliga side Schalke in this transfer window. However, Conte’s admiration for the full-back is shared by his old club Juventus, who will fight Chelsea for his signature. 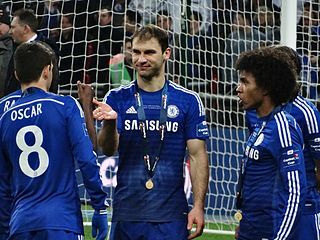 Ivanovic has joined Zenit St Petersburg on a two-and-a-half year deal, with the Blues allowing him to leave for free in recognition of his long service. Kolasinac, like Ivanovic, is versatile, and plays either at left-back or centre-back, which could essentially kill two birds with one stone for Conte. Chelsea are still expected to buy a big-name centre-half in the summer, but the need for that would be diminished were Kolasinac to arrive. Schalke are likely to allow the move because the 23-year-old is out of contract in six months, so this is the last day they will be able to command a fee for him.